What does it mean to be alive? What is it worth to stay alive? Ireland, 1890: two ruthless immortals prowl the theatre district in search of food for their ‘Angel’. Ancient, pitiless and caring for none but their own twisted family, they will stop at nothing to maintain their grip on life. A seamstress, the young man who loves her and a penniless American magician soon find themselves imprisoned in a snow-bound country estate, the latest addition to the family’s warped collection. Here, they are nothing but food, nothing but entertainment, and soon they will be nothing at all. Far from their homes and fighting for survival, Tina, Joe and Harry will come to understand that far more is at stake than their lives. 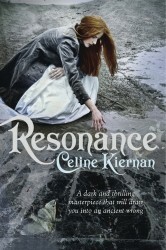 Celine Kiernan blends the supernatural, sci-fi and romance to superb effect... as compelling and unsettling as Poe's ghastlier moments.